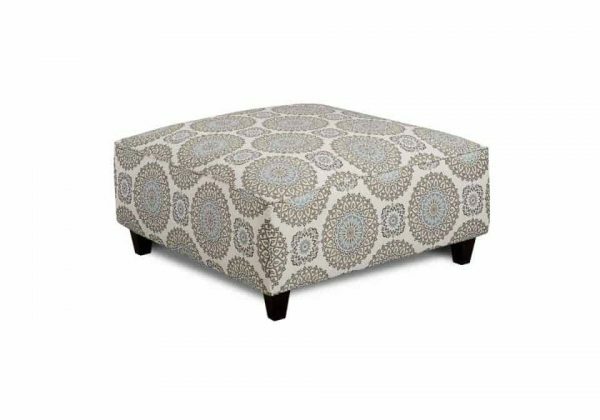 Create a welcoming look in your home decor with this pleasant and warm ottoman. Featured item may appear in photo with others that are sold separately. Foam Construction Our foam is an industry standard 1.8 density with compressions varying according to cushion size. All cushions are Dacron wrapped to give the cushions an attractive crown. All styles in our line-up have fully reversible cushions. Springing System At Fusion, we use a sinus springing system. We reinforce the springs with a 16 gauge border wire to maintain a uniform ride in our seating. We double spring on the ends nearest the arm to give a good balance in the seating. We use approximately 5 springs per seat. Fiber The fiber we use at Fusion is an imported conjugated hollow-fill fiber that gives each filled pillow the rebound needed to ensure quality, comfort and life. For a more information about Fusion Furniture’s warranties, click HERE. At Fusion, we support a 1 year warranty to original purchaser on all parts. **See warranty tag for details on fabric warranties. Customer Service is a very important issue in retail furniture and we will strive to handle all claims in a timely and consumer-friendly manner. After many years in the furniture industry, the family of Bo and Alison Robbins saw the need to fuse together the most important elements of a successful manufacturer, retailer, and consumer-friendly relationship. STYLE.VALUE.SERVICE. FUSION of STYLE, VALUE, and SERVICE.